Studies show that the more a parent is involved with their child’s life, the more successful the child will be. I believe it. There is a relationship between effort and result. My experience as a parent bears this out. I was fortunate to be an integral part – despite their pleas, begging and exhorting to the contrary – of every aspect of my kids early years. From Den Mother to PTA President to peeking through the window at karate (because someONE “can’t like mom there”), I have been involved. And I am glad. know firsthand that it’s not easy being a parent. I know there are massive demands on your time and energy and I honestly don’t know how all of you do it so well. Especially those will full-time jobs and more than two kids – you are all my heros. At Kaju AZ we support you 100 percent. Please consider us part of the “village” required to raise your child. We are here to help keep your child alive, be it via self-defense and martial arts or just a good old-fashioned shoulder to lean on. Parent appreciation night is right around the corner. This is our opportunity to recognize your efforts for washing the gi’s, transporting, cheering, icing, bandaging, refilling our toilet paper rolls when we aren’t looking – all 100 million things you do to help us and your children. Dinner will be served. Professor’s famous pies will be consumed. Funnery (an Aunty-ism) will occur. 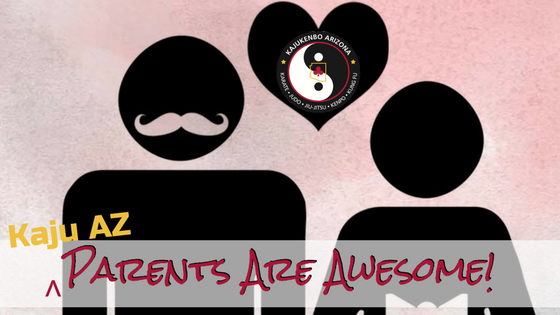 You will learn interesting facts (some you may not even expect) about all the Kaju AZ instructors. We will discuss our philosophies and you will have the opportunity to ask any questions. Be there. Friday, October 20th, 2017, from 6-8 pm at the Mesa dojo. We can’t wait to spoil you!